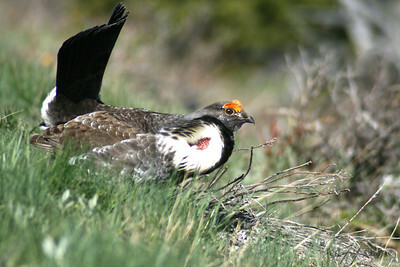 A large Golden Eagle leaving a dead carcass in Montana's paradise Valley. 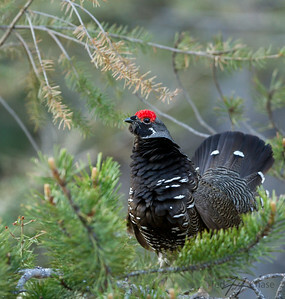 A Spruce Grouse sitting in the trees. 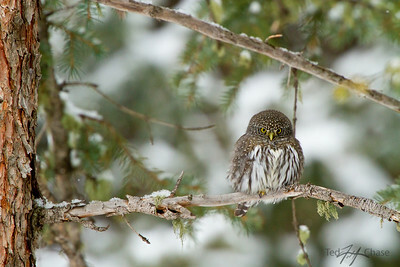 A Pygmy Owl searches for its next meal in the Beartooth Mountains of Montana. 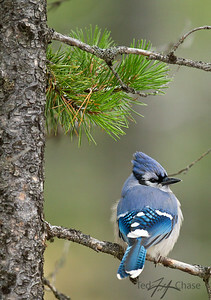 A Blue Jay sits in a lodgepole pine waiting for a meal. 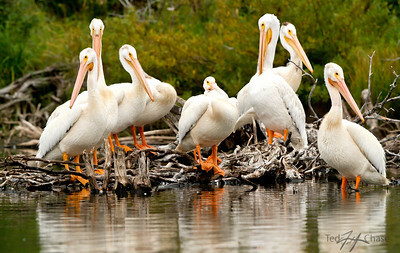 A group of American White Pelicans huddle as I approach in my pontoon boat. 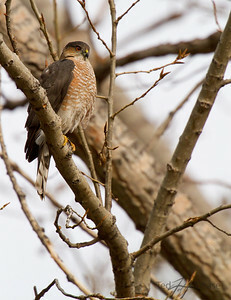 A Sharp Shinned Hawk sits high in a cotonwood tree in winter. 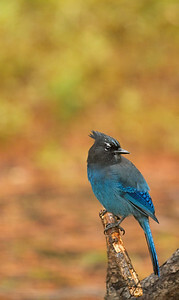 A Great Gray Owl perched as it hunts for food in old growth forest. 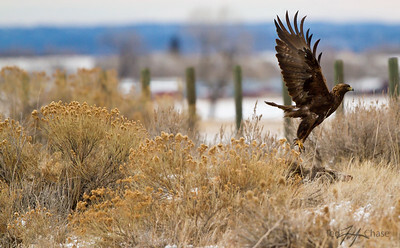 A mature Bald Eagle holding out for the storm in freezing temperatures. 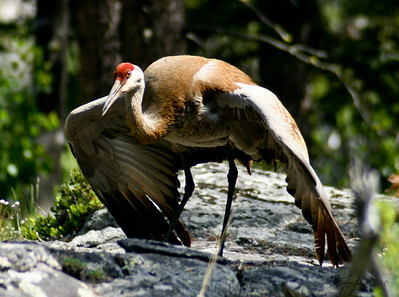 This is a Sandhill Crane protecting a nest close by, they fly away from the nest to protect and keep predators away. 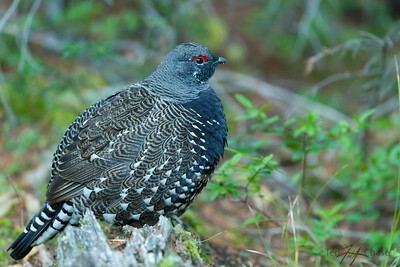 A hen Spruce Grouse sits and waits for a potential mate. 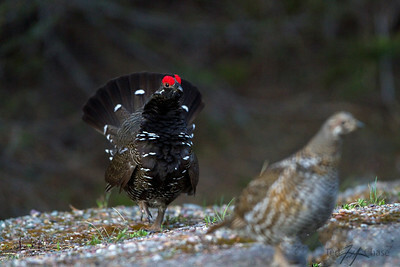 A Male Spruce Grouse tries its best to lure a new mate for the season. 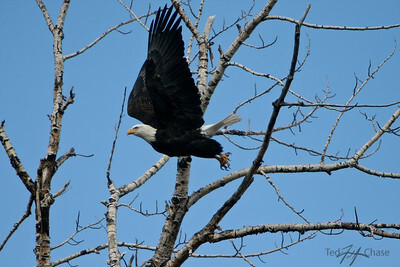 I watched this Bald Eagle land in another tree until the tree branch broke sending him flying once again towards a disaster. 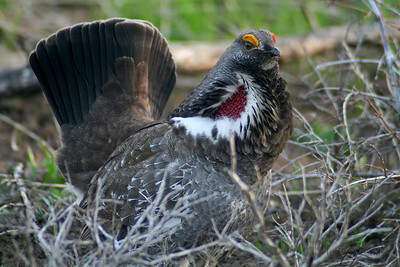 A Blue Grouse sits in hiding calling for a new mate. 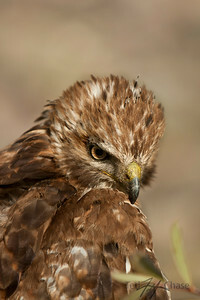 An immature Red tailed Hawk fell from the sky injuring its leg, I was fishing and so I gave it a small fish, then it was gone. 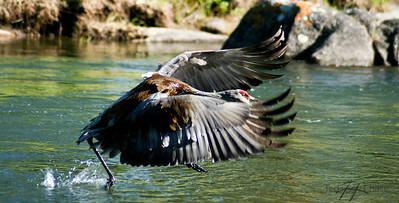 A Sandhill Crane protecting a nest which was close by, I left immediately. 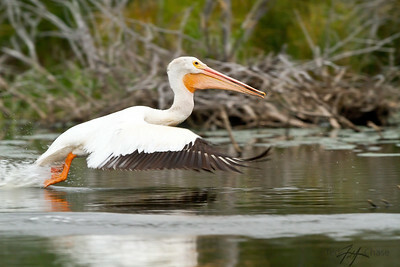 There is always something very Graceful when a Pelican flies over water, they fly so low and close that their wing tips touch the water. 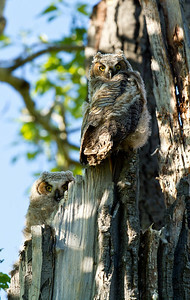 Two baby Great Horned Owls are very close to fledging and constantly in mothers view. 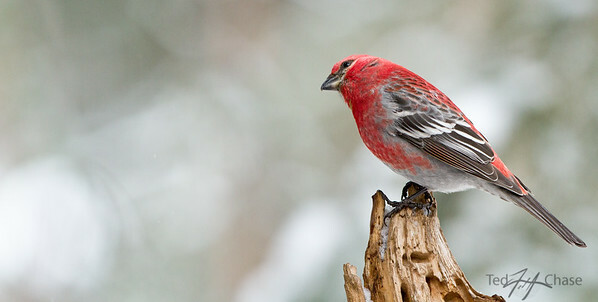 A Pine Grosbeak in winter. 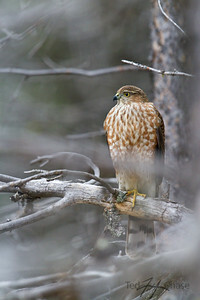 A sharp shinned hawk keeps an eye on its prey as the snow covers the forest.